When you type the RAND() function in a cell you will get a number that is a random integer from 0 to 1. In theory, this means that approximately 50 percent of the time you will get a number that is less than 0.50 and the other 50 percent of the time you will get a number that is above 0.50. To get an idea of how this works lets take a look at the data below. Once you have this function it will randomly generate a number, simply press F9 key to generate a new random number. 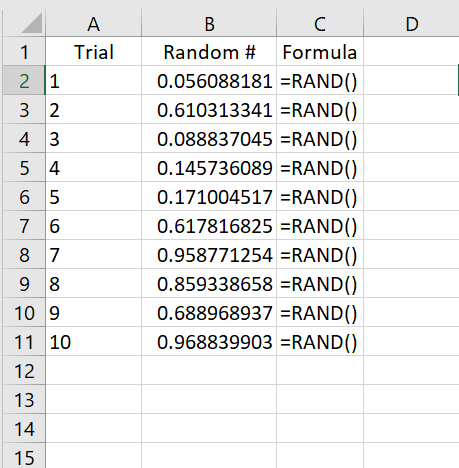 You can see from the image above that you only have to enter the formula to generate a random number from 0 to 1. 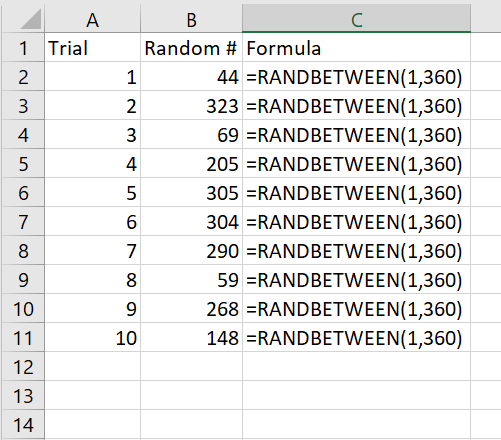 Create a random name generator in Excel with RANDBETWEEN Function. So we have covered the random number generator. Now lets learn how to use what you have gained from the RANDBETWEEN function to generate names or any text by using the CHOOSE function. Using the CHOOSE function allows you to set an index and value associated with at index. So, for example 1 = Bill, 2 = Steve, and so on. Combing these looks like the below.